It’s a difficult and meticulous process tasting over 20,000 Italian wines from thousands of producers, narrowing it down to just a handful (well, 399 to be exact). Each October, Gambero Rosso publicly releases their closely-guarded “secret list” of the best wines of the coming New Year, all to great fanfare. We’ve pulled together a handy guide to the Tre Bicchieri 2013 winners, sorted 3 ways that will help you more easily find these noteworthy wines in local and online wine shops. 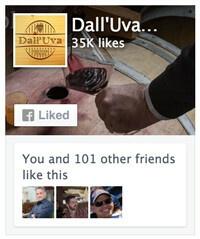 Print this out and take it with you the next time you go searching for new and interesting Italian wines. Download our handy summary guide. Download our 32 page portable guide to the 2013 Tre Bicchieri winners. Print it out. Share with friends. 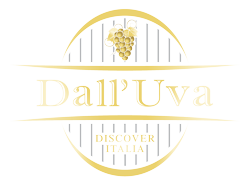 Buy the 2016 edition of Vini d'Italia. 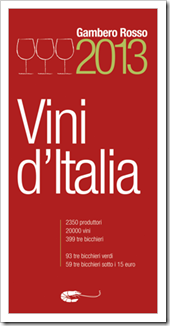 Order your own copy of the Italian Edition of Gambero Rosso's Vini d'Italia 2016. Will you send me the review (text) of the Cantele Salice Salentino Riserva 2009 please? With the third generation of the Cantele family – John, Paul, Umberto and Luisa – the adventure continues with competence at this wine producer. Their own 50 hectares of land, mostly located between Guagnano, Montemesola and San Pietro Vernotico, is predominantly red soils, and Cantele adds 100 hectares of land worked by a trusted group of winemakers followed constantly by company technicians. Cantele offers a wide range of wines with modern styles, both indigenous and international grapes, which over the years are showing a remarkable consistency of high quality. Returning to their Tre Bicchieri Cantele, not the Amativo 2010 which is a blend of Primitivo (60%) and Negroamaro, quite relaxed and pleasant; but with the Salice Salentino Rosso Riserva 2009, with its crisp aromas of blackberry, spices and Mediterranean macchia, with a palate that is consistent, long and elegant. This wine won the award for the best quality / price ratio. Well made also is the gritty Teresa Manara Negroamaro 2010, and the spicey Varius Syrah 2010. The white glasses are assigned to wines awarded 1, 2 or 3 glasses in years previous to the current award year. The "La Stella" (star) is something a wine producer earns when they have had at least 10 Tre Bicchieri awards. The Asterisk means the wine is a particularly good value for the quality of the wine.